Links International Journal of Socialist Renewal readers can read an excerpt HERE. Read Barry Sheppard's review of Revolutionary Activism in the 1950s & 60s: volume 1 HERE. September 9, 2014 – Links International Journal of Socialist Renewal -- These books cover the impact of the worldwide youth radicalisation that emerged in the 1960s and 1970s upon two sections of the Fourth International, one in France and the other in Britain. In both countries, this was a period of tumultuous events, including the US invasion of Vietnam and the international movement that erupted against it. To present the context both books deal with it is necessary to go back a bit and provide a brief explanation of the developments in the Fourth International during the 1950s and early 1960s. In 1953, a major split in the International saw its sections aligning themselves with two major international groupings, one led by the International Secretariat, and the other by the International Committee. In Britain, the Socialist Labour League (SLL), led by Gerry Healy, was a supporter of the International Committee while two much smaller groups adhered to the International Secretariat. In France, there were two groups of nearly equal size, which came to be known in the period these books cover as the International Communist Organization (OCI), led by Pierre Lambert, and the Internationalist Communist Party (PCI), led by Pierre Frank. The predecessor of the OCI supported the International Committee, and the PCI, the International Secretariat. The Fourth International’s Canadian section, which Ernie Tate had joined in the 1950s, and the US Socialist Workers Party supported the International Committee. Important political and organisation questions were involved in the 1953 split, but were largely overcome by the early 1960s. This led to a rapprochement, discussions and a reunification in 1963 at a special World Congress. It elected an International Executive Committee with broad representation of the sections, and which in turn elected a smaller United Secretariat to meet more often. On both sides there were groupings that refused to join the reunified Fourth International. From the IC side the SLL and what became the OCI stayed out, as did the Latin American sections of the IS led by Juan Posadas. These groups, and a few others who considered themselves Trotskyist, were not part of the reunified Fourth International, which organised the majority of Trotskyists worldwide. When I refer to the “Fourth International” in this review, I mean the reunified FI. One of the political differences that emerged from the 1953 split concerned the tactic of “entryism sui generis” – entryism of a special type -- practiced by sections of the International Secretariat, whereby these sections “entered” the mass social-democratic or Communist parties in their respective countries, with very little or no public existence of their own. The International Committee argued the view that such “deep entryism” had the danger that the sections would be swallowed up by the mass reformist parties, and could disappear. This in fact did happen in certain countries, such as India. In any case, in the IC view, the new tactic would make it difficult to recruit to the sections, since recruitment would come only from within the mass party, and would have to be done very carefully because these parties would likely expel Fourth Internationalists if they were ever found out. The only adherents of the reunified International in Britain and France were the International Secretariat groups, due to the defection of the SLL and the OCI, and these were “deep entered” into the Labour Party and the Communist Party respectively. Bensaid’s and Tate’s books deal extensively with the overcoming of this legacy of “deep entryism”. In both countries, challenging this tactic in the late 1960s resulted in the establishing of strong public sections of the FI, with the formation of the Revolutionary Communist League (LCR) in France and the International Marxist Group (IMG) in Britain. Because of language, the United Secretariat decided that the US SWP and the Canadian section, the League for Socialist Action (LSA), would take on major responsibility to help rebuild a section in Britain. To this end, two members of the Canadian section, Alan and Connie Harris, who originally were from Britain, moved back there. With help from the SWP’s publishing house, they set up a book distribution centre to help circulate Trotskyist literature. Joe Hansen had been the SWP’s representative on the new United Secretariat, but was forced to return to the US because of a severe illness, and was replaced by Ray Sparrow, shortly before Ernie and his companion Jess MacKenzie arrived in Britain from Canada in 1965, on assignment from the United Secretariat to work with the small IS groups to rebuild a viable organisation. Ray would work closely with Ernie, visiting London often from Brussels, which was where a new FI centre was being established. Ernie and Jess had been recruited in Canada, but Ernie was originally from Northern Ireland and Jess from Scotland. What they faced upon arrival were the Revolutionary Socialist League (RSL), led by Ted Grant, and the International Group (IG), led by Ken Coates and Pat Jordan, both claiming to support the FI, both small organisations. Ernie’s assignment in part was to try to get these two groups together, but it soon became apparent that the RSL wasn’t interested, and in fact pulled away from the FI altogether. So Ernie and Jess worked mainly with the IG group, which was centred in Nottingham, not London. The IG was deep in the Labour Party, and Ernie found that although it was doing quite good work there, it was sadly lacking in building a public face of the FI in Britain. One of Ernie’s assignments from the United Secretariat was to help further the work of the Bertrand Russell Peace Foundation, headed by the great mathematician and philosopher. Russell’s secretary, Ralph Schoenman, a courageous, imaginative and prodigious organiser, and according to Ernie was its central sparkplug. Pat Jordan and Ken Coates of the IG would soon become active in the Foundation. One of the Bertrand Russell Peace Foundation’s most important projects was to form an “international tribunal” to investigate US war crimes in Vietnam. Another was to launch the Vietnam Solidarity Campaign (VSC) in Britain. Ernie provides documented detail from several archives about how these projects and the foundation itself functioned, giving an insider’s view. These stories alone are worth the price of the book. It’s the first time, to my knowledge, that this history has been told. The foundation faced massive opposition to the tribunal idea: the press in Britain was viciously hostile; the US, British, French and other governments consciously intervened through their security agencies to disrupt it; the Stalinists in Britain quietly sabotaged it; Moscow made trouble with the Vietnamese, whose cooperation would be essential to getting it off the ground; and most of the revolutionary left in Britain didn’t understand why Vietnam was important in the world class struggle. Under these pressures, there were squabbles internally, sometimes compounded by prickly personalities, and financial difficulties. But through all this, the tribunal succeeded, and produced impressive findings that helped the antiwar movement throughout the world. The Vietnam Solidarity Campaign took off. The leading role that Ernie and the IG comrades played in building the VSC led to the establishment of a viable section of the FI, with the IG changing its name to the International Marxist Group, and breaking out of its deep entryism in the Labour Party. The successive demonstrations demanding that the US get out of Vietnam and the reversal of British support for the war under a Labour Party government became increasingly larger in a short few years, culminating in the biggest demonstration London had ever seen, when over 100,000 gathered in Hyde Park in the autumn of 1968. The scope of these actions can be gleaned from some of the photos in Ernie’s book, which are a surprising revelation in themselves. One shows Tariq Ali alongside the great actress Vanessa Redgrave and the world-renowned theoretical physicist Stephen Hawking, in the front of one of these mass demonstrations. Another shows Tariq and Vanessa with Richard Branson in tow – he would later found Virgin Airlines. Tariq Ali, already prominent in Britain as a left-wing intellectual, would soon join the IMG as a result of its leading role in these events. An interesting aspect of the VSC Ernie describes was the role of the British International Socialists (IS) led by Tony Cliff. While not as deeply involved as the IMG, especially at the leadership level, the IS, unlike other Trotskyist groups, gave their full support to the VSC. The IS was also increasing in size at that time, even faster than the IMG. Partly as a result of this common effort against the war, and the attraction of the IMG’s sister organisation in France – which had played a key role in the May-June 1968 student-worker revolt, Tony Cliff approached the IMG with a proposal to unite the two organisations. Reading Ernie’s book was the first time I became aware of this offer. Cliff proposed that the IMG comrades be recognised as a tendency in the proposed new organisation and be allowed to retain their affiliation to the Fourth International. Ernie was favourable to this proposal, but others in the IMG leadership rejected it, a blunder in my opinion. The whole situation of the revolutionary socialist left in Britain could have made an important step forward, as Phil Hearse says in his preface to the volume. Daniel Bensaid, as he tells us in this, his last major work, was born into a family that was immersed in the milieu of the French Communist Party (PCF), one of the largest CPs in Western Europe. As he says, “Communism was something I fell into – unless it was communism that fell into me.” He joined the CP student group as a youngster. Here his path would cross with young members of the PCI, “deep entered” in the PCF. 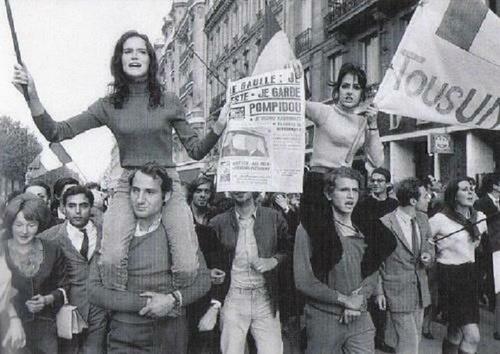 PCF-influenced young people were becoming increasingly critical of the party, especially around the issue of its lukewarm attitude toward the Algerian revolution. The French ruling class had waged an extremely brutal war to retain Algeria as a colony. While France won the war militarily, it lost it politically, and was forced to grant independence to Algeria. A fascist die-hard group within the French army known as the Secret Army Organization even threatened to overthrow the government, and there were street battles where the PCF youth gained experience that would later be useful in the May-June 1968 student-worker revolt. Another issue where the youth began to move to the left of the party was on the question of Vietnam. The French CP, like its British counterpart, under orders from Moscow, took the position that the war should be settled by negotiations with Washington, as against the forthright demand that the US get out. These and other differences led to the PCF expelling its youth in 1965, leading to the formation of the Revolutionary Communist Youth (JCR). The JCR leadership was mainly comprised of Trotskyist youth, including Alain Krivine, Henri Weber, Jeannette Habel and Gerard de Verbizier. Daniel was an example of those leaders of the JCR who were not in the PCI. This development had begun as part of the PCI’s deep entry in the PCF. But the logic of the evolution of the PCF youth, where the PCI young people rose to prominence, transformed the deep entry tactic into its opposite with the public emergence of a new organisation, the JCR. Another important issue that led to the formation of the JCR was the Cuban Revolution. This section of the PCF youth was ardently in support of the revolution and its young leadership, against the lukewarm and conservative positions of the adult party, reflecting Moscow’s attitude. Indeed, the position adopted by the majority of Trotskyists worldwide in support of the Cuban Revolution and its leadership (while holding certain criticisms) was central to the unification of the majorities of the International Committee and the International Secretariat in 1963. The impact of the Cuban Revolution in Canada is explained in volume one of Ernie’s book (which I reviewed earlier this year). Our common position on Cuba led to close relations between the JCR and the US Young Socialist Alliance (YSA, the youth group associated with the SWP). Daniel explains how Che Guevara’s humanist socialism, expressed in his pamphlet, Socialism and Man, helped his generation to throw off the dead weight of Stalinism. He also credits Che’s speech in Algiers, taking the Kremlin to task for its high-handed and bureaucratic relations with Cuba and Vietnam. The formation of the JCR helped spur the process that led to the creation of the IMG in Britain, as Ernie explains. JCR leader Alain Krivine spoke many times at VSC demonstrations. Another example of this cross-fertilisation was the holding of a conference of FI youth groups in Europe, which YSA leaders also attended. Part of all this was the very radical German Socialist Students Union (SDS, not to be confused with the organisation with the same initials in the US). At the centre of the student and youth radicalisation, the JCR grew quickly, as Daniel explains in some detail. Early in 1968, Daniel, a student in Nanterre and a leader of the JCR there, worked closely with Daniel Cohn-Bendit, an anarchist, in the explosion of student struggles that would coalesce into the March 22 Movement, struggles which rapidly spread across the country. This led to the eruption of the “night of the barricades” in early May around the Sorbonne in Paris, as the riot police tried to suppress a meeting called by the JCR. The JCR led the fighting against the cops, and organised the student youth of different political tendencies into a united front. No one could have predicted it, but the spectacle of young people fighting the cops to a stand-still stirred sympathy in the French working class, suffering under the yoke of De Gaulle’s authoritarian government. The workers’ rapidly went into action, taking over and occupying factories, leading to the greatest general strike in history. The story of the May-June events is told elsewhere, but the role of the JCR gave it great prestige. In November 1968, Caroline Lund and I relocated to Brussels. I replaced Ray Sparrow as the SWP’s representative on the United Secretariat, while Caroline represented the leadership of the YSA. Early in 1969, we went to Paris to observe a leadership meeting of the JCR, which discussed the JCR fusing with the PCI. I remember Daniel was still sceptical of joining the FI. There was also a mood in the meeting among these young people of disappointment in the older members of the PCI during the May-June events: “they didn’t show up” was one remark I remember. But by April, the great majority of the JCR was won over to this perspective, and the result of the fusion was the creation of the Communist League as the French section of the FI. “Entryism” had come to an end in France. After being banned later, it would be renamed the Revolutionary Communist League (LCR) in 1974. In referring to this organisation in this review I use LCR, which it became widely known as in the subsequent decades. Both these memoirs discuss, Daniel briefly and Ernie more fully, the 1969 World Congress of the Fourth International, where a majority voted to launch rural guerrilla warfare for a prolonged period in Latin America. The focus was immediately on Bolivia and Argentina. A minority, including the SWP, opposed this orientation. Ernie and Jess were at the congress, as were Caroline Lund and I, and Daniel, who was part of the French delegation, although he doesn’t mention this. The minority position was presented to the delegates by Joe Hansen of the SWP. The minority was not opposed in principle to peasant-based (rural) guerrilla warfare in the oppressed countries where the need for land reform was urgent, as a possible tactic in certain situations when coupled with building revolutionary working-class parties in the urban centres through militants becoming rooted in the struggles of the workers. But any decision to launch such a guerrilla struggle would have to be based on a concrete analysis of the political situation in each country, and would have to include an assessment of the size of our forces, which were small. In any case, the minority considered it wrong for the FI to impose such a tactic on the sections, something only they were in a position to implement. The majority had made the error of a schematic analysis that in the situation of US-backed military dictatorships (and there were many on the continent) there could be no democratic openings, and any workers’ uprising would be simply crushed. Therefore, the only strategy for the whole continent was rural guerrilla warfare for a prolonged period. The majority had elevated a possible tactic in some countries into a general line and strategy for a whole continent. The representatives of the Bolivian section to the congress were enthusiastic for the majority orientation, and were, we found out, in the process of attempting to implement it. The Argentine section had split over the orientation before the congress, with one group led by Roberto Santucho (although he was not at the congress) supporting the majority and well on its way to implementing the proposal. The other side of the split, led by Hugo Moreno, supported the international minority. The young leaders of the LCR, including Daniel, were not only enthusiastic for the majority, but actively lobbying for it in the corridors. A central motivating factor in winning the youth of the LCR and the many young people who were joining the European sections, especially after the May-June 1968 events, was the unreserved backing and vigorous arguments in favour of the guerrilla strategy presented by three older central leaders of the FI, Livio Maitan, Ernest Mandel and Pierre Frank. As the discussion unfolded, the mood was that the FI would soon lead liberated zones in many countries in Latin America. Livio Maitan even predicted that the next World Congress would be held in Bolivia. Ernie describes how the British delegation (except for Ernie and Jess), which had been inclined to support the minority before the congress, was so swayed by this euphoria that they switched sides. The attempt to apply the new line on the ground in Bolivia was quickly crushed in a month or so after the congress. In Argentina the process also led to disaster, but took some years to play out. Ironically, about this time, in both Bolivia and Argentina there were big democratic openings that led to massive worker’s struggles. Those sections in each country that implemented the 1969 World Congress line, stood apart from these workers’ battles. Daniel and the LCR played an important role in supporting the Argentine group led by Roberto Santucho in carrying out first the rural version of the tactic, then urban guerrilla war. Santucho’s Revolutionary Army of the People (ERP) embraced fully one postulate of the 1969 World Congress, which visualised peasants and urban intellectuals initiating armed actions outside of the workers’ organisations. Some these ERP actions were spectacular, but futile. The horrible tragedy that ensued over time resulted in the slaughter by the armed forces of hundreds of wonderful and devoted but misguided comrades, many of whom Daniel personally knew, as he describes his many trips to Argentina to support the ERP. Reading his chapter about this tragedy, “Cry for Argentina”, I was moved to tears remembering these fallen comrades. My impression is that while not saying so outright, Daniel felt great guilt about his role in their fate. Ernie also has a chapter on what happened to the ERP in Argentina. While Daniel’s account is beautifully written and personal, Ernie’s is a powerful factual account based on scholarly sources. The turn of the 1969 World Congress was not to be limited to Latin America, but signaled an ultraleft turn for many sections, especially in Europe. The idea for Europe was that the sections would undertake “minority actions”, including in some cases “minority violence” that would draw in other groups to the left of the CPs and social democrats, and which in turn would galvanise the working class into action. Such wheels within wheels, with the smallest eventually turning the great wheel of the working class, left out the need for a mass revolutionary socialist party rooted in the working class. This was a misguided reading of the May-June events in France. Indeed, it was the lack of such a party that led to the dissipation of the pre-revolutionary situation that developed in France in May-June 1968. The majority predicted in 1971 that successful proletarian revolutions would take place in Europe within five years. The result was that the differences that emerged at the 1969 World Congress deepened, and led in the next years to the formation of two factions, the International Majority Tendency (IMT) and the Leninist Trotskyist Faction (LTF). There were splits as well in many sections of our international movement, including in the US, with opposing groups lining up with one or the other international factions. This debilitating situation wasn’t overcome until late in 1976, when the majority of the IMT adopted a resolution, “Self Criticism on Latin America” that repudiated in detail the 1969 World Congress. By that time, the “Hasty Leninism”, as Bensaid characterised the ultraleftism of the LCR and many European sections in the first half of the 1970s, had also run its course. The way was open for the dissolution of the factions, and an attempt made to rebuild the international, which Caroline Lund and I were part of, along with other younger leaders from both the former IMT and LTF. An account of this long faction fight is more completely told in my two-volume political memoir, The Party, which covers my years in the SWP and Fourth International, and deals with much of the period that Ernie and Daniel discuss. These three books are in fact complimentary concerning this period, for better or worse. I say for better or worse because they are the only books, whatever their strengths and weaknesses, that are about this part of the history of the FI as a whole. Daniel, in his brilliant work, does in essence repudiate the ultraleftism of those years of “hasty Leninism” he was part of. Maybe it’s too much to expect, but I find fault with some of his attempts to gloss over the mistakes of the LCR leadership, including his own. I will give only one example, his reference to a document that became famous in the faction fight that was co-authored by him, titled, Is the Question of Power Posed? Let’s Pose It! The discussion of this document in Daniel’s book evades its content, which was none other than to propose guerrilla warfare for France, along the lines of the ERP in Argentina. To this end, it argued, the LCR should begin to prepare to go underground. Following closely the line of the ERP, the document affirms that the road forward for the LCR was via the French peasantry and “urban middle layers”. The majority of the LCR leadership quite wisely rejected this course. In Ernie’s second volume, a chapter on Healy’s launching a physical attack on him for selling a pamphlet critical of the SLL. This not only showed the degeneration of Healy by the mid-1960s, but also the reaction of many on the left too frightened of Healy’s tactics to come to Ernie’s defence is telling. There is also a chapter of how Ernie and Jess got to know Tamara and Isaac Deutscher, through Ernie and Deutscher’s work around the Bertrand Russell Foundation. This sheds new (at least to me) insight into Deutscher, who is most well known for his three-volume biography of Trotsky. Ernie also mentions Deutscher’s work, The Non-Jewish Jew, which referenced figures such as Spinoza, Marx, Heine, Freud, Rosa Luxemburg and Trotsky. This leads me to Daniel’s own chapter dealing with this question, called “The Marriano Enigma”, on his own non-Jewish Jewishness, as well as the whole “Jewish question” and Israel. It is a very good chapter. He recalls a joke I remember from that time, concerning the fact that many of the LCR’s leaders were Jewish: The only reason the LCR leadership meetings were not in Yiddish was because Daniel was Sephardic. While not wanting to lessen the importance of Daniel’s other chapters, I would note especially the one on “Restrained Violence,” which in part comes to terms with the days of “hasty Leninism”, but expands further to discuss other forms of political violence, including that of imperialism. And also “Colour Rouge”, dealing in part with the LCR’s launching of its paper, Rouge, as a daily, which Daniel was at the centre of. “Duck or Rabbit” deals more broadly with the press, including the left and the bourgeois press. These are thoughtful chapters. Another I liked was his musings inspired by being in Mexico at Trotsky’s “Blue House”, which has a good and eloquent outline of the Dewey Commission on the infamous Moscow Trials. Another penetrating part is Daniel’s thumbnail sketch of the three volumes of Marx’s Capital and their relevance to the world today. There is a main theme in Daniel’s book, which runs throughout text. He takes it up from many different viewpoints. He reveals it with observations about his own beliefs, held until his death, and in polemics with others. That theme is to sharply repudiate all those who have abandoned their youthful Marxist and revolutionary ideas, politics and activism for the bourgeois life. He is especially dismissive of all those soixante-huitars -- the “sixty-eighters” -- who were in the streets in May-June 1968, but have turned their backs on the best thing they had ever done in their lives. Some of these are former LCR members, including Daniel’s former mentor, Henri Weber, who became a senator for the social democrats. As we know, there has been a counter-revolution to “the Sixties” led by the bourgeosie worldwide, which has drawn into its wake many former fighters, intellectual and physical. Daniel, who became in his final decades one of France’s major public intellectuals, a position he attained without conceding anything to bourgeois opinion – all the while fully committed to building a revolutionary organisation – takes them all on, from Foucault to the theoretical retreat by many from Marxism with ideas known as “post-modernism”. An example in Ernie’s book is David Horowitz, who worked with Ernie in the Bertrand Russell Foundation, and is known today as a neo-conservative. Daniel had to learn, as we all have to, to live with disappointments and setbacks. He had to learn to temper his youthful impatience with the way the world is into a “slow impatience” – which by the way is the correct translation of the title of his book. Daniel Bensaid remained true to this profound idea. The same can said of Ernie Tate.